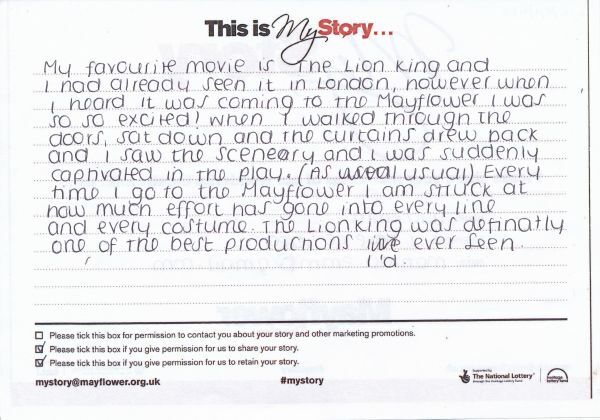 My Story card: Tilly Emm remembers seeing The Lion King. My favourite movie is The Lion King and I had already seen it in London, however when I heard it was coming to the Mayflower I was so, so excited! When I walked through the doors, sat down and the curtains drew back and I saw the scenery and I was suddenly captivated in the play. (As usual) Every time I go to the Mayflower I am struck at how much effort has gone into every line and every costume. The Lion King was definitely one of the best productions I'd ever seen.